I'm really enjoying watching you design this stuff up. I don't quite get the internals of how that force sensor works but that's pretty niffty to be able to determine how the leg has landed. Can't wait to see what this behemoth looks like when completed! I finally found the photos I took of the machining of the impact housing. This should make it clearer how it works mechanically. The first photo shows what the force resistor looks like and the second photo shows the resistor glued inside the housing. The 3rd photo is the leg attachment, the o ring on the far right is used to keep the lower leg centered while the other 2 o-rings that are together are used to provide the force used to actuate the force resistor. There are 2 o-rings so that the sensor can be actuated when the leg has weight on it and when the leg is up. The 4th photo shows how the pieces fit together mechanically. 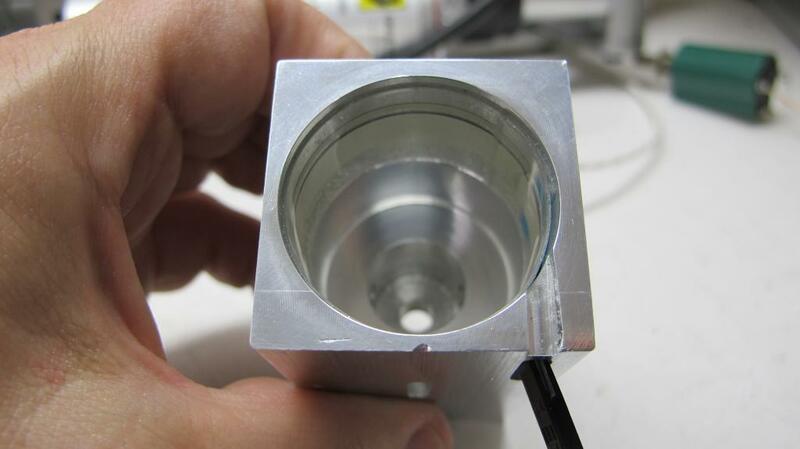 The washer is a hardened washer to prevent the spring from damaging the aluminum housing. The spring cavity is sized to only permit about .2" of travel before the leg attachment pushes up against the housing. 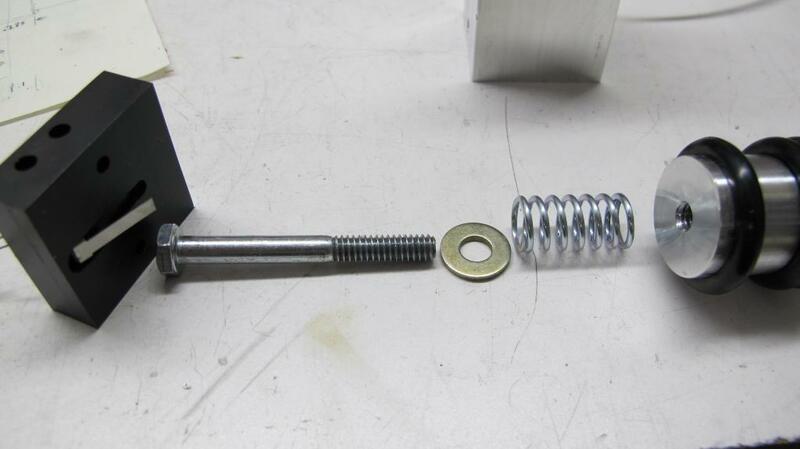 The bolt is a hardened bolt so it won't bend easily. 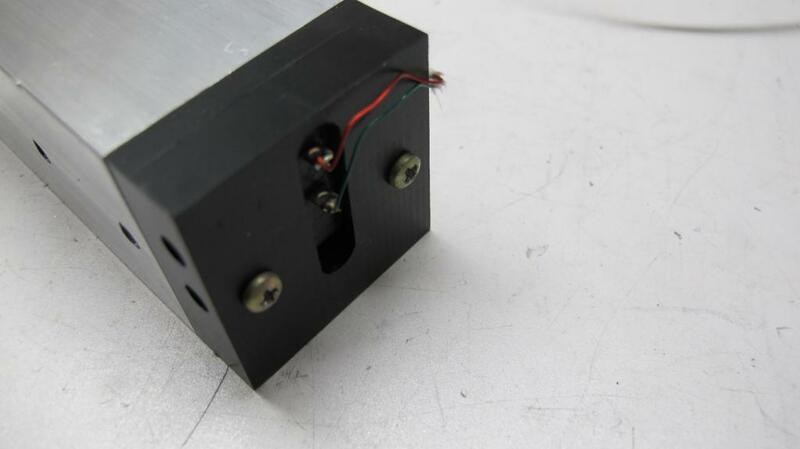 The bolt head resides in a shallow cavity (not shown) and is able to move up and down under spring tension so it can actuate the leg down micro-switch lever. The 5th photo shows everything put together. The black connector is the force resistor connection and the screw in the center slot prevents the leg attachment from rotating internally. 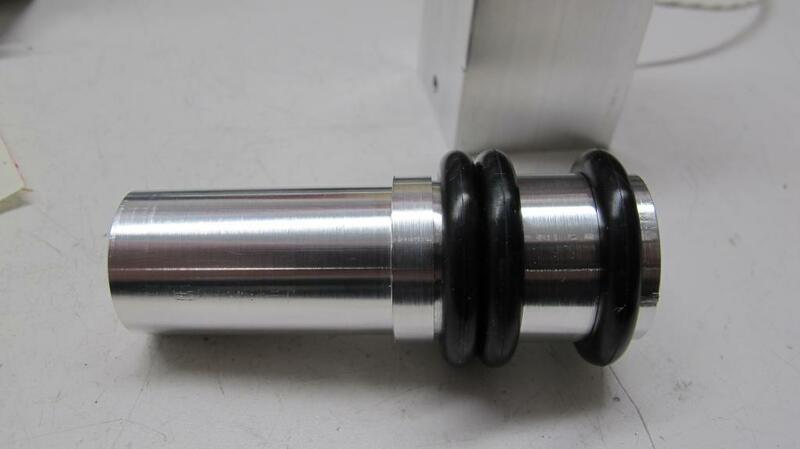 The last photo is the assembly bolted into the lower leg. Very cool. I wasn't getting the resistor tape and how that was registering the pressure but now that I see the arrangement it's obvious. Really neat design! Ohhh... I like that idea too! My little stepper bot doesn't have the guts to really mash something too much. I've been trying to figure out two issues, floor contact (more importantly, the impending loss there of -- think stairs to base and certain death) and bump sensors. There is a LOT of stuff around the IR's miss completely. There is a LOT of stuff around the IR's miss completely. Agreed. IR doesn't catch everything. Check this maze video (someone else, not me) and the cruel little "stick" of a wall in the middle of the square. It doesn't hit it, but i's not clear if the robot really senses it or not. Got CAD files updated and the CAM instructions are ready for the CNC mill. 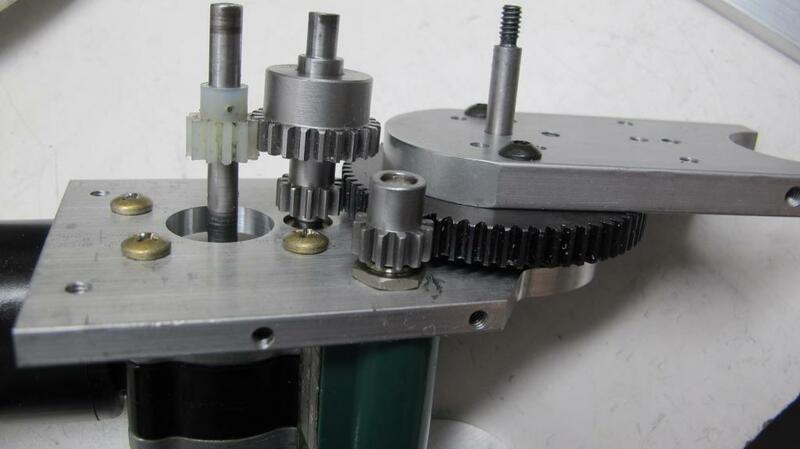 I'm planning on today machining the gear train assembly for testing. Camera is ready and photos to follow the progress. I liked the bumper idea, how did that work out for you? My sensor is well protected and the o-rings should prevent damage. The only thing I worry about is that the leg isn't going to be "stiff" enough, I may have to add an additional centering o-ring where the leg enters the housing. Testing and time will tell! It's off to the shop! Bob: How much do you figure your bot will finally weigh? Your parts look plenty beefy, weight creeps up fast. When I built my little robot arm, I became acutely aware just how significant the weight of the servos and arm structure becomes. 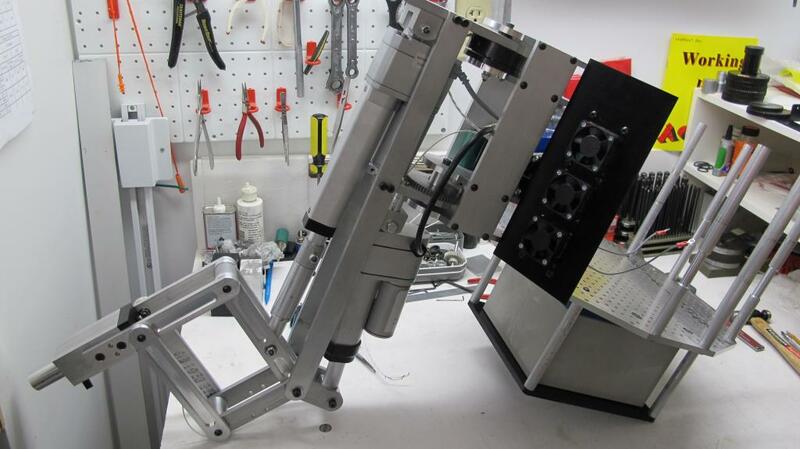 The usable payload at the end of the arm is a tiny fraction of the total load on the shoulder & elbow servos. Counterspringing can help. Have you considered that for your bot? This is going to be a pretty hefty beast! Right now each leg weighs in at around 20 lbs x 6 = 120 lbs. the body will add 10-15 lbs and batteries another 35 lbs. That totals up to around 170 lbs! The actuators are pretty hefty, each can move 100 lbs so I'm not too concerned about weight at this time. Also, the design is set up so that power isn't needed to maintain a position which reduces the needed power requirements. I didn't design in speed for this, it won't go breaking any records in that department but it should look cool! Spent most of the day in the shop, machined 4 brackets so far. Ended up breaking 2 6-32 taps (Grrrrrrrr!) and had to go out and pick up some more taps. Luckily both taps broke in the same part so I only have one to make. It'll go faster this time around since the CAM program has been tested and verified. Back to the shop, more tapping to finish and creating a shaft for the gear train on the lathe! Photos to follow. 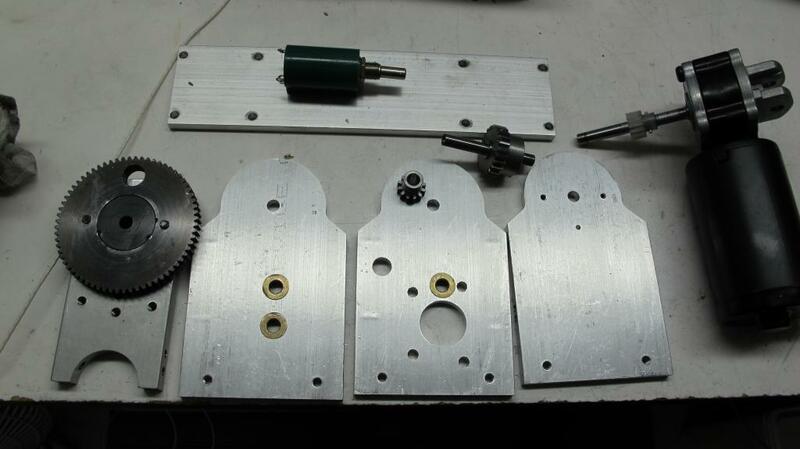 Here is the results of a weekends work on revision 2 of the gear train. It turned out fairly good but needs some minor changes to the CAD files. I've decided that I don't like the large spur gear after all... it was something I had left over from some other project but it was a custom gear that doesn't mesh with the DP24 gears as well as I hoped. It actually calculates out as DP 24.7 which I thought would be OK. So I ordered some DP24 66 tooth hubless gears for revision 3. 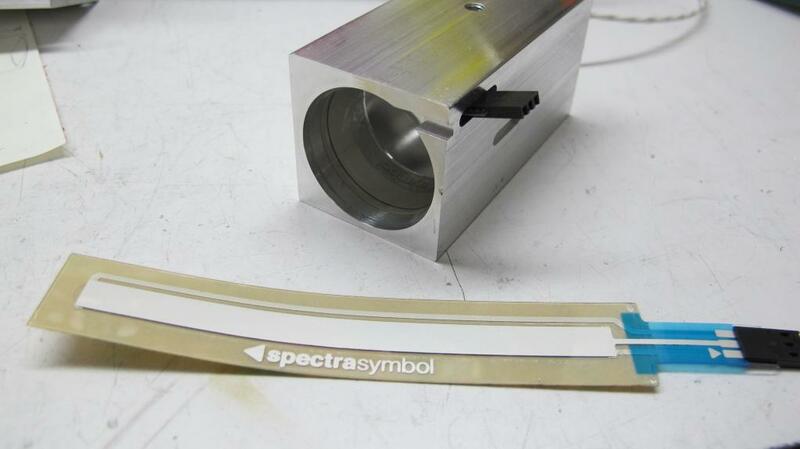 Here are some photos of the machining process, parts and final assembly for your viewing pleasure... 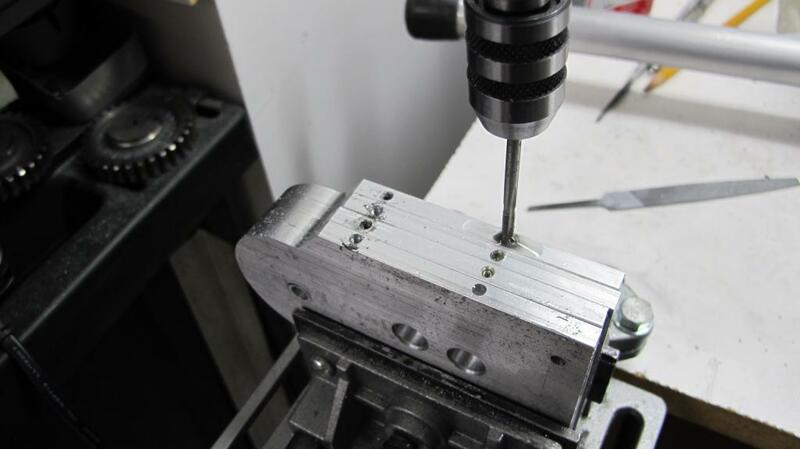 There were a lot of holes to hand tap, one of these days I'm going to get an automatic tapper for the CNC. Anyway, progress continues slowly, I hope to bring a completed leg to the Prop show in Chicago on June 23rd but I want something that can actually do something! I don't know if I've posted in this thread before, but I want you to know that I am rooting for your success on this project! I had found this thread some time back, but then "lost" it and couldn't find a link. Tonight I found it again, and bookmarked it for the future. I've always been a fan of the Odex-1 functionoid, and have often thought about building a replica, but lacking the parts, tools, and time - well, it was more a pipe dream than anything else. I am glad to see this project is in your capable hands, as you seem to have everything in place to bring it off. I can't wait to see the final results. GO BOB! Thanks for the encouraging words! There have been more than a few times I've wondered about what I've gotten myself into... But the challenge of the build has been fun, the frustrations of multiple versions that don't quite work out right (most mistakes don't get documented here!) and finding the time, money, and motivation have all been issues also. I knew going into it his project that it would potentially take over a year of work just to get the mechanicals down correctly. Yahoo! 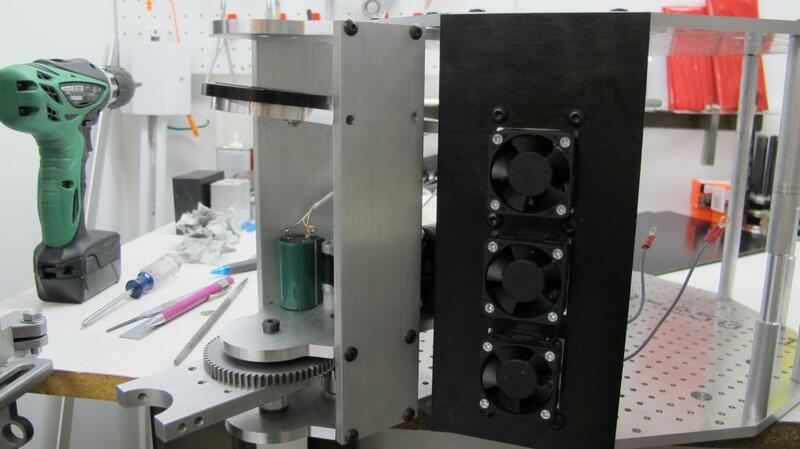 The new gearbox is complete and it works! That was a major bit of heart ache that took a lot longer to create than expected. Started setting up to mill the body plates. At $60 apiece, I don't want to mess this series of cuts up. I'm using MDF to validate the CAM instructions and then the MDF board will become the backer board for the aluminum. I'll attempt to get some photos of the machining operation. Looking better for having something to take to the Propellor Expo in a couple of weeks. I made my reservations and will be there Friday night. Looking forward to seeing your progress is person. We will see you on Friday ( June 22nd ). Very cool. I can't wait to see it doing some moving around! Do you output the code for AL and then just use feed rate adjustment to up it for MDF? Every time I try to setup a program for some soft material and then switch to metal I forget a feed rate somewhere and make an whoops. It's been a long couple of days machining the main body plates. I've completed one and am 1/2 way through the 2nd. I'll finish it up tomorrow. While the mill was happily drilling the 500 holes in the plate, I cut out the supports that go between the 2 plates. A little work on the lathe to face the ends and bring them down to the correct length. I've done 6 of the 12 supports but my mini lathe is too short to mount the drill for drilling a hole along the axis. I guess I'll have to figure out another way of getting the holes drilled. In the mean time I'm done in the shop for the night but I'm going to do a quick CAD of the motor controller support pieces. This should be a fairly easy part to mill out. Each controller will have a bracket that screws into the support pieces between the plates. I took pictures of the milling process, I'll get those off the camera before the weekend is out and post those. I'm going to be bringing what ever parts I have made to the Parallax Propellor Expo in Lombard Ill next weekend so if you can make it over there, come on by and introduce yourself! I'll be the one with the one legged robot...... Hopefully it'll be moving under program control during the event! That was a long weekend spent mostly in my basement shop. But I have a lot to show for the effort. Here is a short video of the 4 hours needed to create one plate condensed down to under 3 minutes. 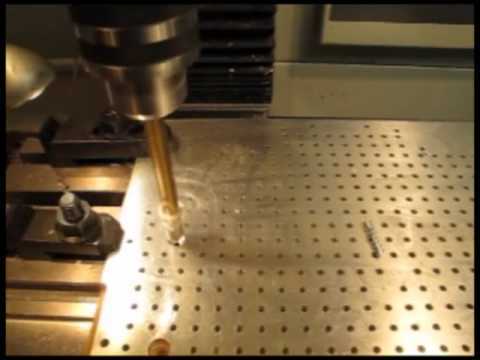 The sequence in the video is using a spotting drill for all the holes, followed by drilling through all the holes with the smallest drill and then drilling the 4 large holes that were used to clamp the piece down while milling out the outside edges. The last sequences are milling the edges and the final drilling on the second side.. It was a long session but the results came out great. I'm very pleased with the resulting pieces. The Aluminum plate started out at .25 inches thick and 14 inches square. 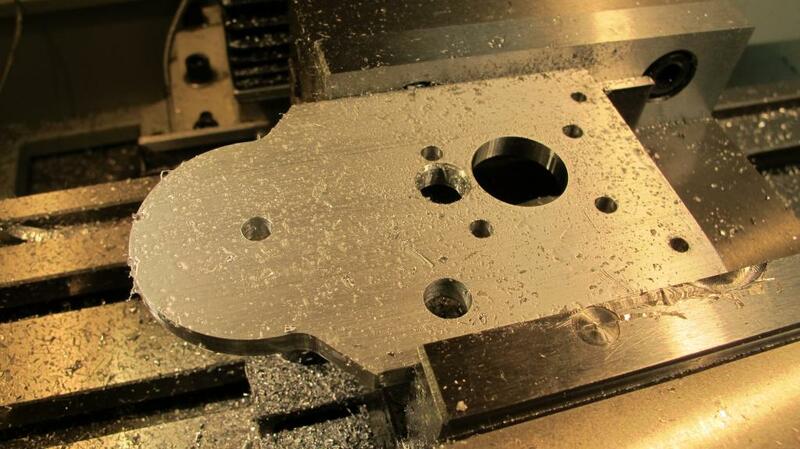 Since it is larger than my mill table it was machined in 2 sequences, one half at a time. It took a lot of time to get the plate positioned correctly and for the drilling sequence. Since I didn't know exactly where I would need holes in the future other than the ones around outside edges I decided to do a hole pattern of 0.5 inches. 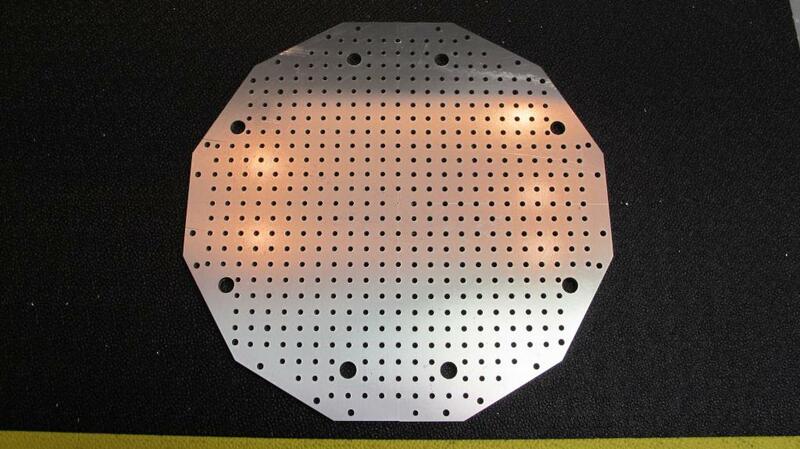 The holes are sized for tapping with a 10-32 screw if needed. The photos show the parts made. 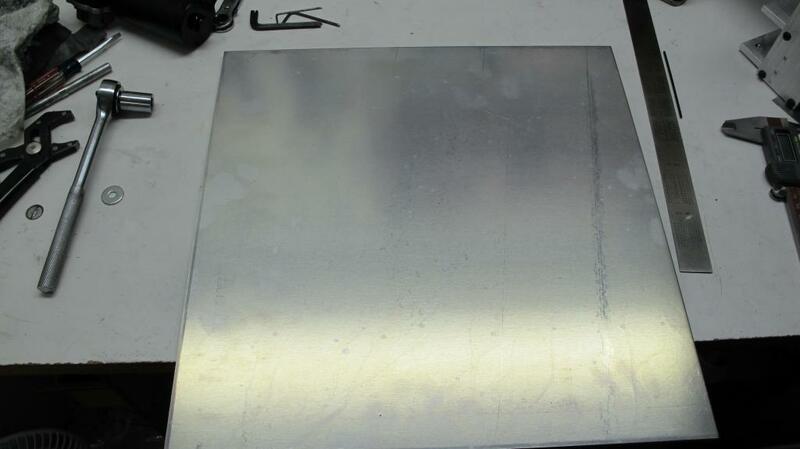 The first picture is the original aluminum plate and the 2nd is the plate after machining is completed. 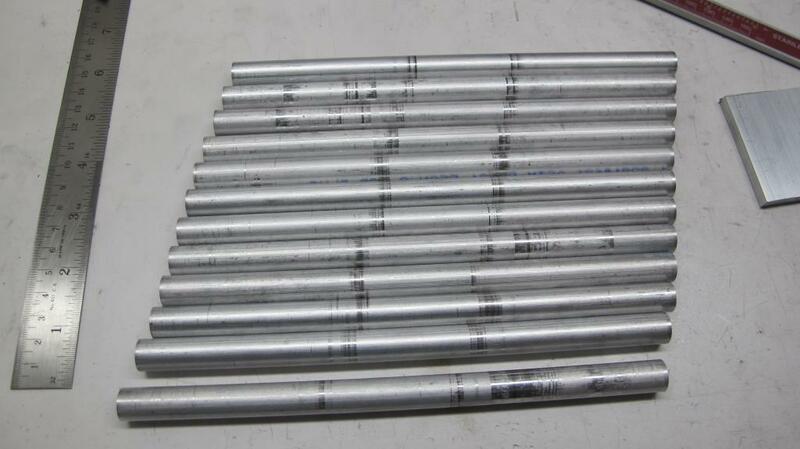 The 3rd picture shows the 12 standoffs that separate the top and bottom plates and are 8.25 inches long. 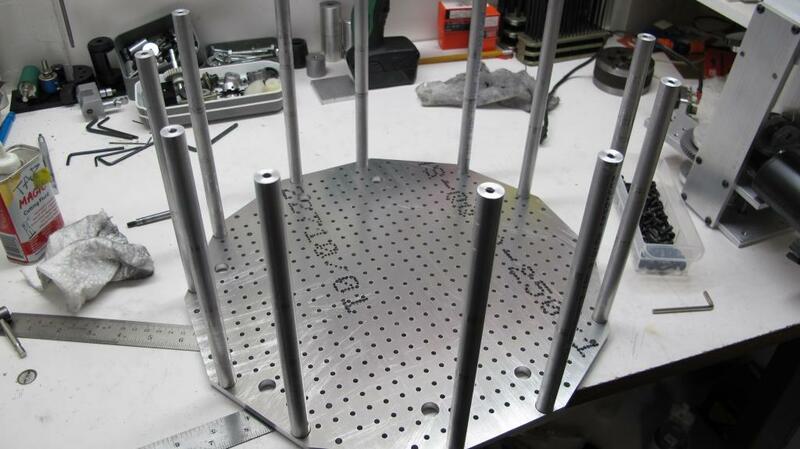 The next picture is the standoffs attached to the base plate. I needed a means of mounting the HB-25 motor controllers and came up with a neat idea that is in the next picture. I created 3 bars of 0.5 inch aluminum with a radius cut into both ends so that they slide inside the standoffs. 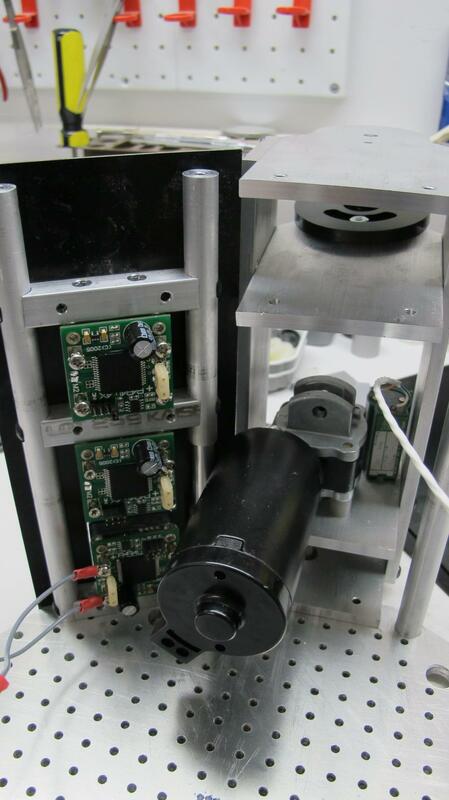 Photo 6 shows the completed motor controller assembly. 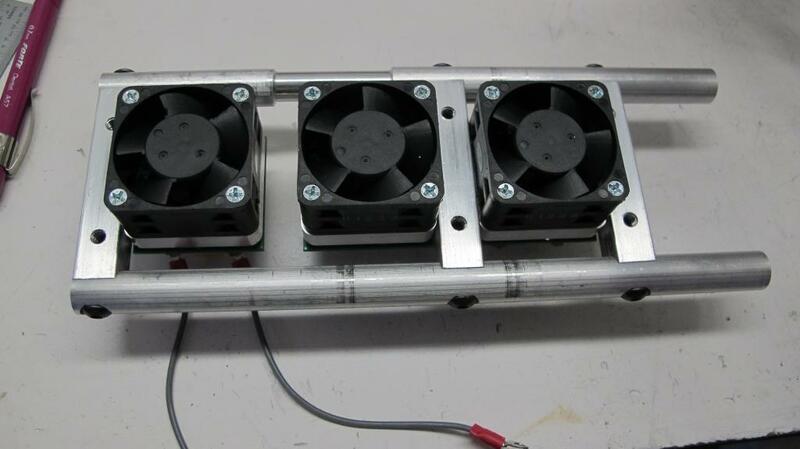 I made a plastic cover that mounts over the fans and hides the inner workings as seen in picture 7. 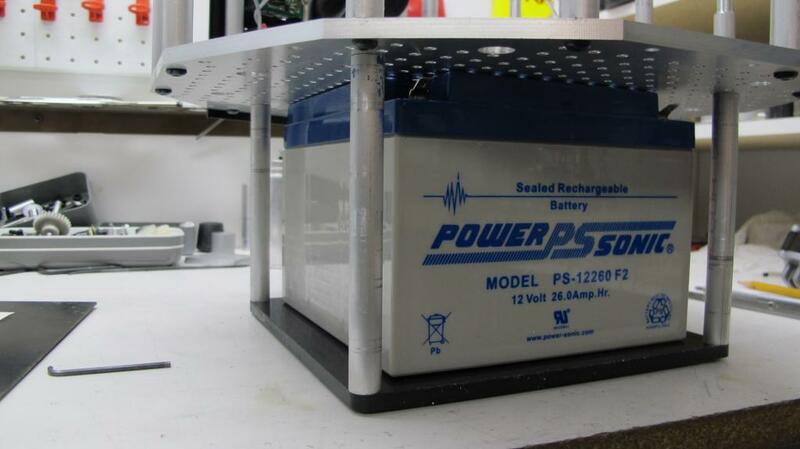 Picture 8 is the battery box which hangs below the bottom base plate (the last photo shows this). 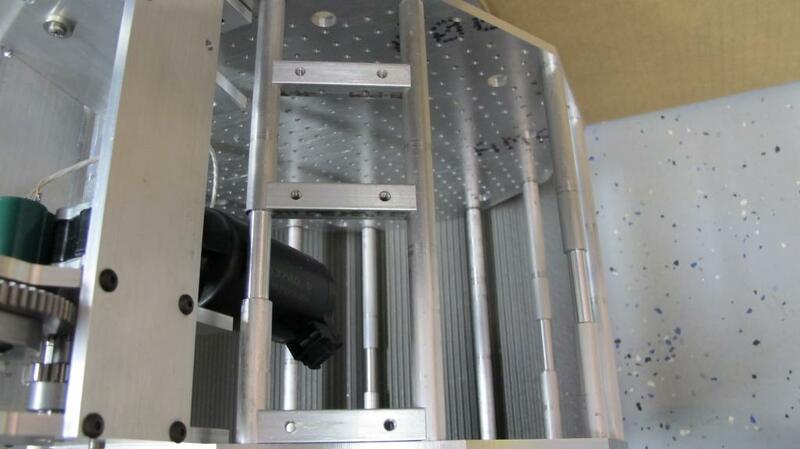 The next to last photo shows the backside of the test leg and controller assembly. The last photo is everything put together, its propped up on my workbench since it wants to fall over otherwise. But that should give everyone a good idea of how everything hooks up together. I'm getting ready to go back down into the shop and start wiring the leg up. I'm not sure how I want to do this just yet so for next weekend I'm going to cobble something up that will at least let the leg run for for the show. Hopefully I'll still have time to get some demo programs up and running also! That hex plate is beautiful. Only bad part is that AL just doesn't stay nice looking for long. My deck is already getting ate up. I wish I had a big enough oven to powder-coat it. The HB-25 driver mounts are very slick too. Man that thing is a monster! There are some Al polishes that keep it looking good for a long time. You should try them out. That last picture really tends to show off it's size! Amazing work, Diverbob! It's a long range project; kudos to you for doing it with discipline and thanks for keeping the updates coming. When this thing walks, you will be justifiably proud. That last picture really to puts it in perspective. I knew it was going to be a big machine, but that gives a better idea just how big. To recap my comment, "WOW"
Do tell if you have one that you can suggest! I'm planning out the revision 2 of my lower deck now that would be a couple inches wider to better cover the wheels and keep from hooking onto every chair leg it encounters. I'd like to keep it looking nice. I got the various sensors, switches, ADC, motor controllers and ADC all wired into a temporary breadboard. I forgot that I needed my laptop to run all this at the show so it's getting updates so I haven't been able to test it all. Hopefully tomorrow night I can spend a little time before packing it up for the drive to the show Friday night. The wiring job doesn't look pretty, but it should be enough to allow creating and running some basic movement routines. I'm starting to get some ideas on how to wire up a power control system that I'll start after the show. Hope to see some of you there Friday and Saturday! I have to say it's because of people like you that i am interested in electonics. I want to learn to do what you do!!!!!!! Keep up the amazing work and PLEASE keep posting pics and videos. Not so bad for those of us planning on attending the event in Norwalk this year. I'm looking forward to seeing your project in person. It looks awesome so far! By the time the Norwalk Expo rolls around I should have all the initial software for the individual leg processors about done. I may even have more than one leg completed, although I doubt I'll be able to finish up all 6 until next year. There's just not enough hours in the day and I still have this day job that keeps getting in the way of my hobbies! But, since I'm too young to retire just yet and I like having extra cash for these types of projects, I'll have to prioritize my time. Not to mention the fact that it's nice weather outside and I am 'DiverBob' so that takes some time on the weekends! Anyway, I'm here at the the Chicago Expo waiting for the doors to open so I can set things up. Hopefully I'll see some of you today. I did stop at Fry's Electronics, talk about a gadget lovers paradise! I succumbed to temptation and got myself a new Fluke MultiMete, I've been needing a new one for quite a while and this should last me a long time. I really wanted on of the portable O'scopes but those were well out of the budget range!. I also ran over to American Scientific & Surplus, it was only 16 miles from the Expo. I picked up 2 more of the car seat motors as spares and a few other odds and ends I couldn't resist! It's back to work on the project but at a less frantic pace now that the Chicago Expo is done. Next road trip for the robot, Norwalk, Ohio. I should have a lot more done on the test leg and be able to have it under prop control. I've been working on the design for the main power distribution assembly. 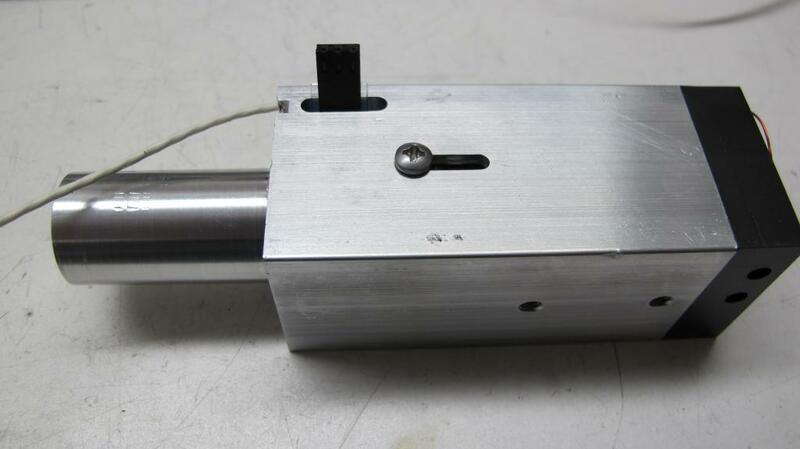 I've got an idea in mind and have been machining the parts for the assembly. I had to order several electrical components when I couldn't find anything in my stash. I'm adding 2, 40 amp power relays and blade type fuses to the system. There will be a key activated master switch and separate switches for motor power and computer power. 3 large 35V, 180,000 ufd capacitors on the motor side to help absorb those power spikes are on the output. 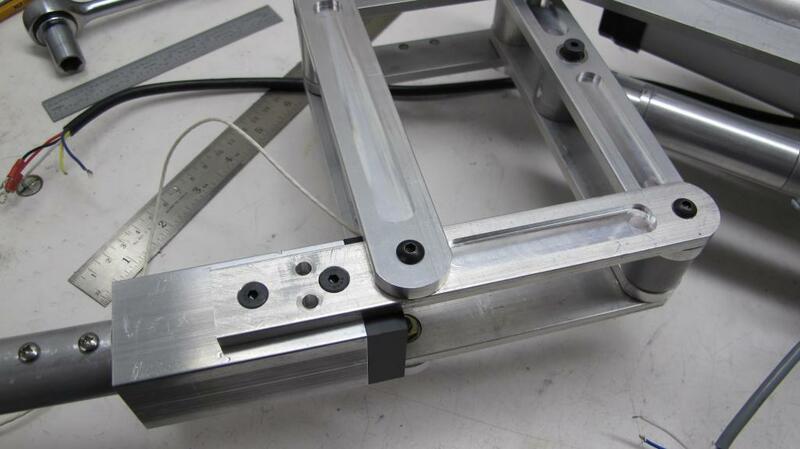 Each leg will be connected to the distribution assembly via molex connectors for easy change out of parts in the future. I always seem to be putting together and taking apart things so this will make it easier to get it right and not accidentally miss wire parts. I also want everything to look nice and professional so I'm taking my time to get it done right or at least my definition of right. Still thinking through how to connect all the sensors coming off the leg to the computer. There are 3 potentiometers for position sensing (3 sensing wires and Pos and Neg leads for each), 1 force sensor (3 wires total), 2 microswitches (2 wires each). That comes up to 16 sensor wires coming off one leg. Even combining the Positive and Negative leads on the leg still leaves 14 wires to deal with. I'm thinking about a small wire to wire connector with a positive locking mechanism (prevent vibrations from loosening the connection) and the wires on the other side of the connector go to the controller board for that leg. I need to find a connector that matches these requirements which will help control the rat's nest of wires I had at the show. I've post photos as the parts come together so all the above ramblings start to make sense. These changes will bring some order to chaos and make it easier to test and troubleshoot.